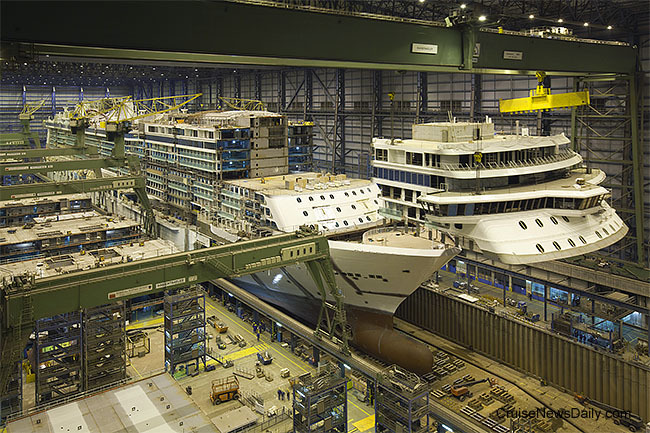 Norwegian Breakaway, under construction at Meyer Werft in Papenburg (Germany), passed a second milestone this morning in as many days. In the first photo below, taken yesterday, the bow section was lifted into place, completing the assembly of the ship's hull. The bow, known to the yard as Block 73, weighed 361 tons and took only 30 minutes to lift into place. The block measured 72 feet long, 101 feet wide and more than 39 feet high. Despite the weight, the process of lifting the bow into place took only about 30 minutes. This is the most forward block of the superstructure that contains the navigational bridge, ports of the spa (the salt room), suites and staterooms. 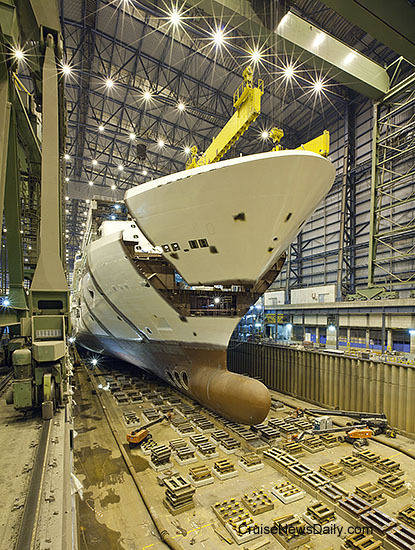 Norwegian Breakaway is scheduled to enter service in April 2013.